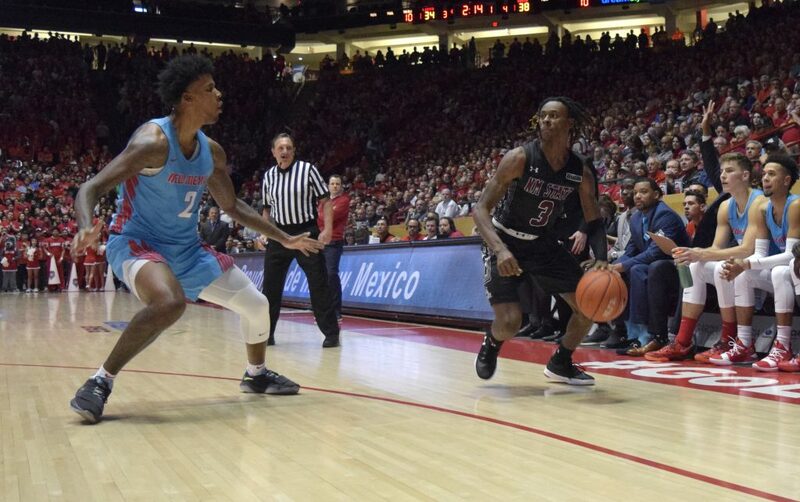 The New Mexico State men’s basketball team defeated its Rio Grande rival, University of New Mexico, 98-94 Saturday, Nov. 17. According to Sports Illustrated magazine, “The Pit” is the sixth toughest venue for visiting opponents in college basketball, and it housed over 14,000 for Saturday’s matchup. Points came at a premium in the first half with only 13 total points scored in the first five minutes. Each team traded scores until the Lobos scored seven unanswered over the Aggies. NMSU gained the lead midway through the first frame with the help of AJ Harris and Jabari Rice. Turnovers from UNM gave Harris an open jump shot and allowed Jabari Rice to shoot a wide-open three. At this point in the game, the Aggies were up 17-13. Both New Mexico and New Mexico State showed they were not going down without a fight. 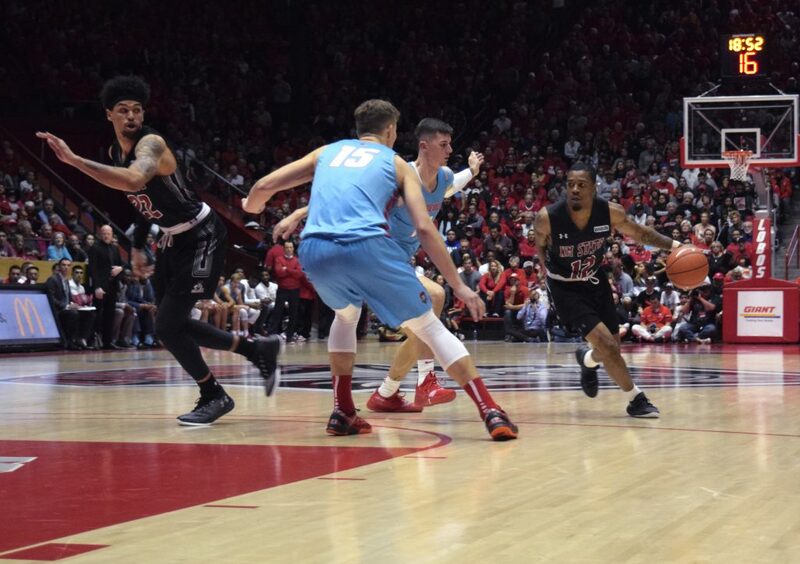 Each team scored point for point until the Aggies separated themselves from the Lobos. New Mexico State’s Mohamed Thiam scored a three to put the Aggies up by eight. NMSU was able to take a 44-38 lead going into the halftime break. To begin the second half, both New Mexico and New Mexico State traded threes. Following a Lobo three-pointer, the Aggies went on a 13-0 run five minutes into the half. 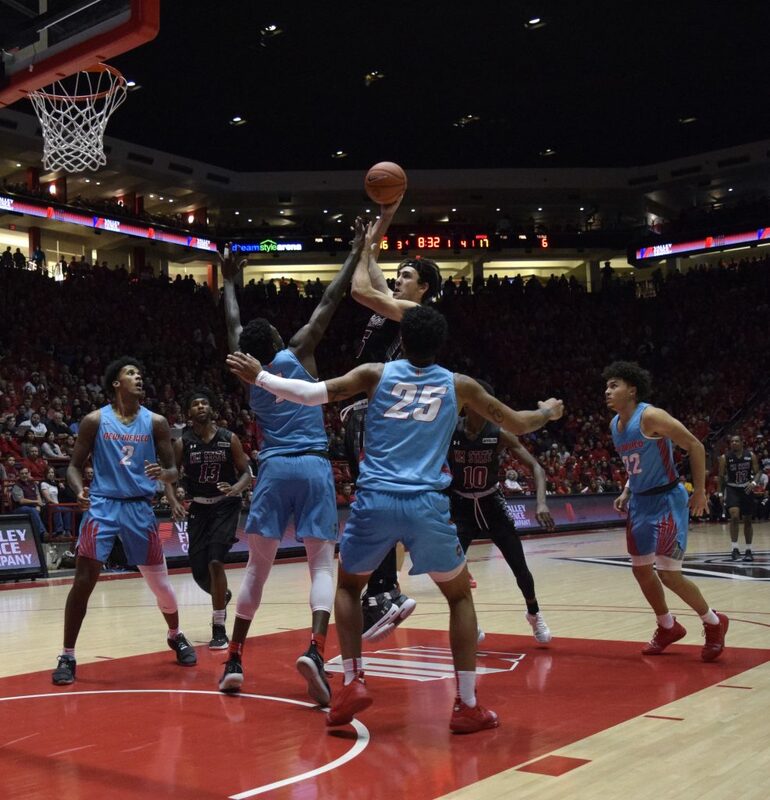 The Lobos slowly tried to eat away at the deficit, but open three-pointers and turnovers ruined the opportunity. 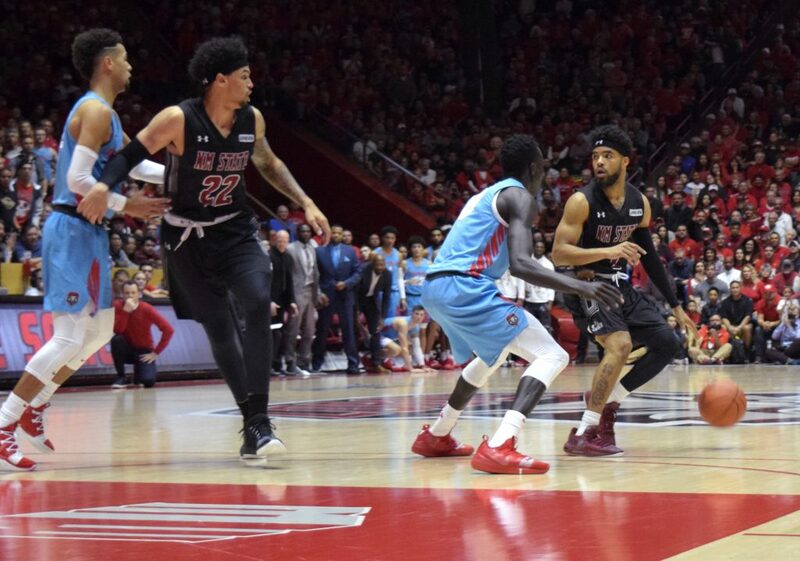 New Mexico State shot almost to perfection off turnovers to get a 19-point lead over UNM. The Aggies were able to sustain the lead while Aggie fans shouted, “Let’s go Aggies! Let’s go Aggies!” The home crowd was quick to diffuse the Aggie chants with chants of its own. A live decibel reader inside the arena showed a reading of over 100. 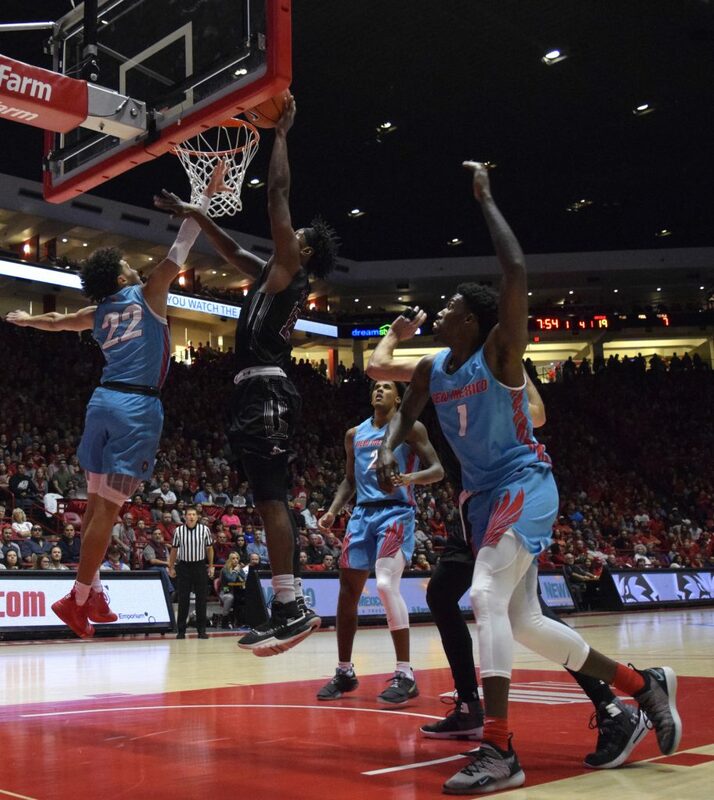 Once the home crowd cheers surpassed those for New Mexico State, the Lobos started to chip into the large Aggie lead. UNM was down double-digits until one minute left in the game. 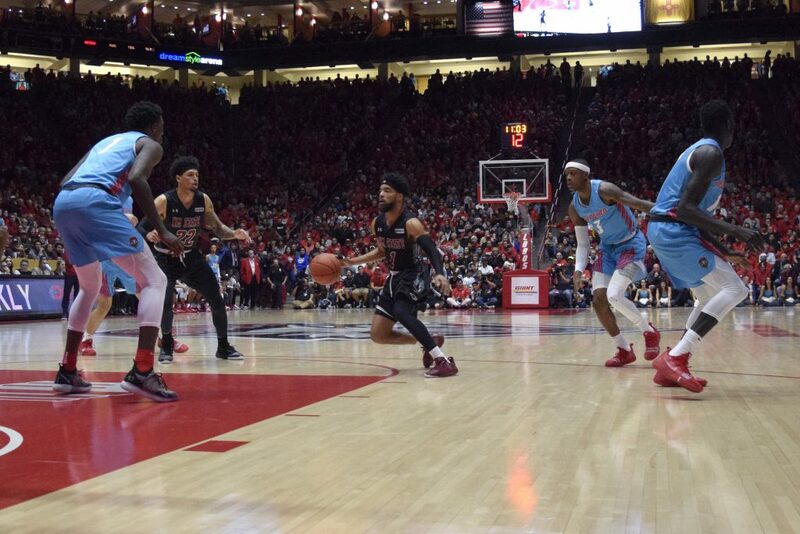 In the final seconds, the Lobos were able to cut the lead to two points. 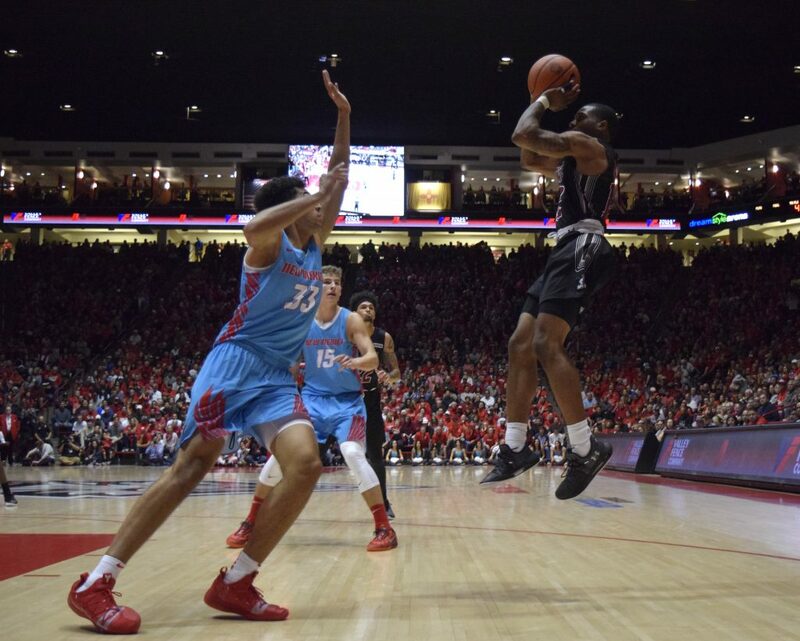 The Lobos had the ball, down by two, when Aggie forward C.J. 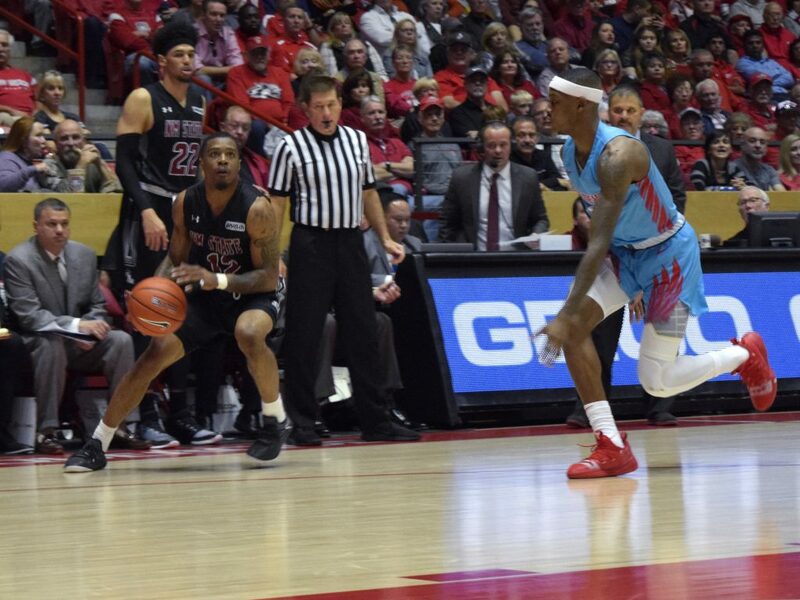 Bobbitt stole the ball and forced UNM to foul intentionally. Bobbitt made both free throws to seal the game for the Aggies, 98-94. AJ Harris and Terrell Brown combined for 51 points for the Aggies with 31 and 20 points respectively. Mohamed Thiam led the game with nine rebounds—three offensively and six defensively. 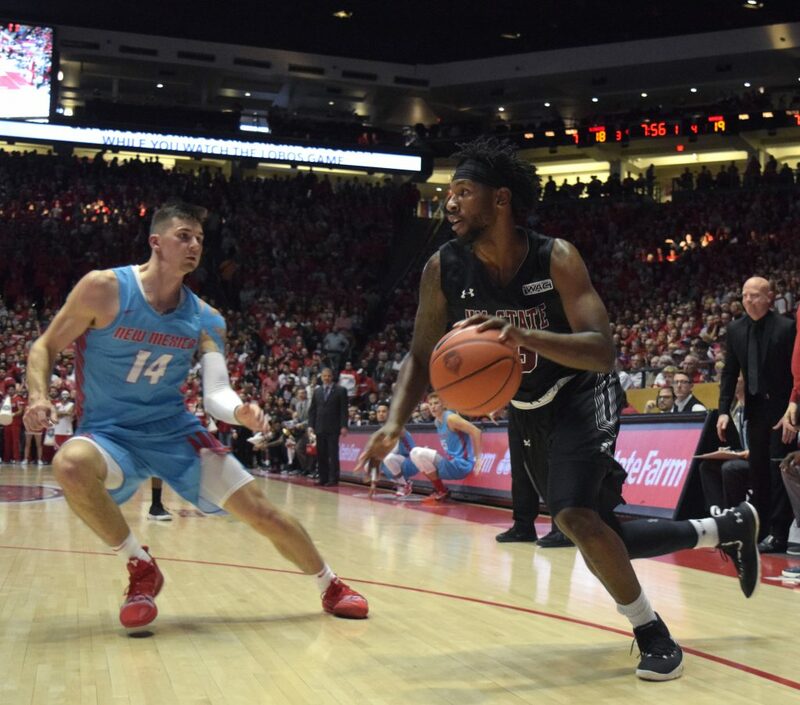 The Aggies improved to 3-1 overall and extended their win streak over the Lobos to four straight. The last time the Aggies had four consecutive wins over the Lobos came during the 1993-94 seasons. Up next for New Mexico State, the Aggies host the Eastern New Mexico Greyhounds inside the Pan American Center Wednesday, Nov. 21, at 6 p.m.